A few weeks ago, we took Sea Gem out to watch the fireworks. After we put Helina to bed, I decided to turn on the A/C to help her get to sleep, and when we aren't plugged into the grid, the A/C requires that we run the generator. And so I turned on the generator, a routine operation. The generator started right up, as it should, and the A/C immediately began cooling down the interior of the boat. And then it got interesting. The interior of the boat soon filled with smoke, and the bilge pumps turned on. I immediately shut down the generator (and, unfortunately, the A/C as well) and looked into the engine room (there is a window for this purpose). The room was so filled with dense, black smoke that it was impossible to see anything. I thought better than to venture inside until the smoke had cleared, but I reasoned that part of the generator's exhaust system had failed, resulting in the generator spewing exhaust smoke and water throughout the engine room. What I did not know was what, exactly, had failed and how expensive and time-consuming it would be to fix. Cost is always a concern, but with our trip north coming up, time is even more sensitive. The generator is really a must-have for our trip, especially since we'll be spending a few days in hot, swampy North Carolina and southern Virginia. And, again, no generator equals no A/C. So what broke? The wet exhaust elbow, and as you can see from the photo, it broke in spectacular fashion. 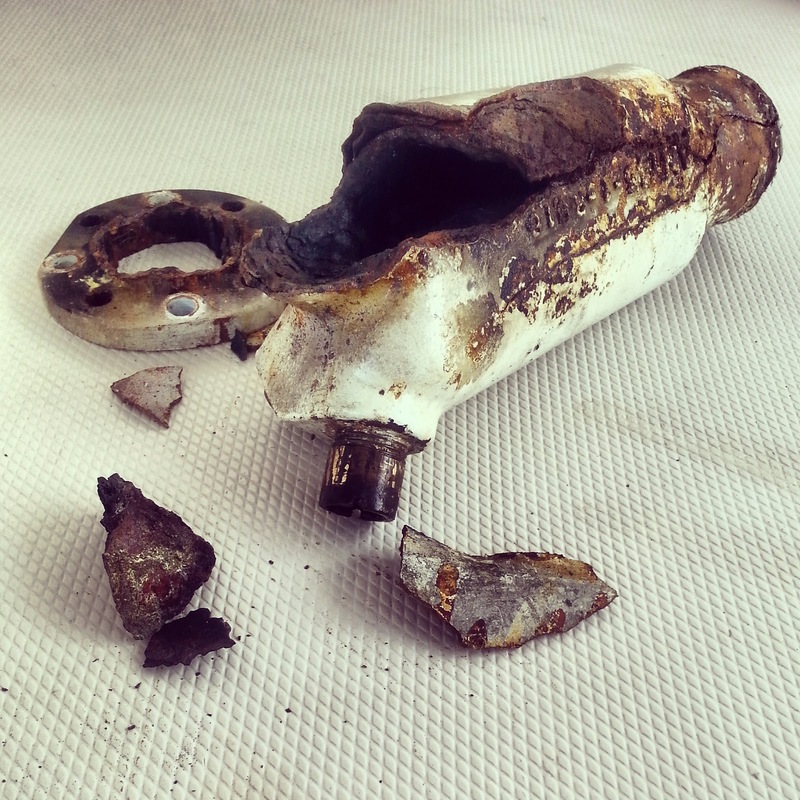 What was once one solid piece of iron turned into at least ten rusty bits. The elbow mixes the engine exhaust with the cooling water pumped from the ocean so that hot exhaust gases do not run through the boat. Unfortunately, a broken elbow yields both hot exhaust gases and gallons of seawater being pumped directly into the interior of the boat. Fortunately, the generator is designed to be easy to service, and I was able to order and install a replacement elbow. The operation took a lot of time and fair expense, but fortunately not enough of either to jeopardize our trip. Plus, a nice bonus of the new elbow is that the generator does not only emit its exhaust outside the boat, where it belongs, but it also runs a good deal quieter than before--amazing what an exhaust system without holes in it can do. Still, where is the luck in all of this? (See title.) The elbow was going to break the next time we turned on the generator. I'm sure glad it broke when we were close to home, with 4 weeks to go before our trip, than while we were at sea, hundreds of miles from home, and in need of a working generator.